How come your plants are so hardy? That is one of the most asked questions. Firstly we grow only the toughest plants. We understand our area and the weather that we can get here in our short spring season. One day it can be shorts and lemonade then the next day it can snow. Ah, that is April in Southern Alberta. Hardy plants have to be made hardy and we do this is several different ways. Firstly we use a combination of fertilizers to thicken the leaves and increase the root mass. We then cool the plants during the day early in the morning before the frost leaves the ground. 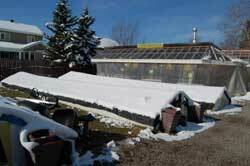 By turning the heat down in each greenhouse at night to just above freezing we condition the plants so they will be ready for placing into our own unique design of coldframes. 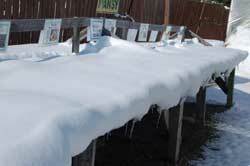 These frames have no heat supplied to them and often the plants freeze solid. 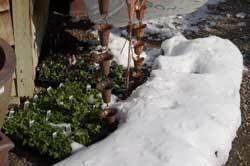 If we have done our job in conditioning the plants then when the sun comes out the plants will thaw and look great. It is rare that we suffer any loss from the cold. 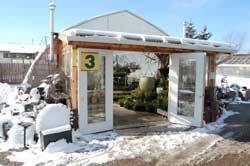 This way of growing plants is old-fashioned and outdated. 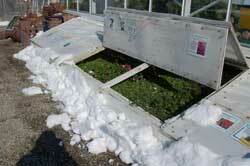 Other greenhouses' do not even start their plants until only a few weeks before they open for customers. Our first seeding is in September so they are grown slowly with care and attention. Katrina likes to think that in this high speed world where everything is instant, the art of growing plants has not changed much since development of commercial horticultural.